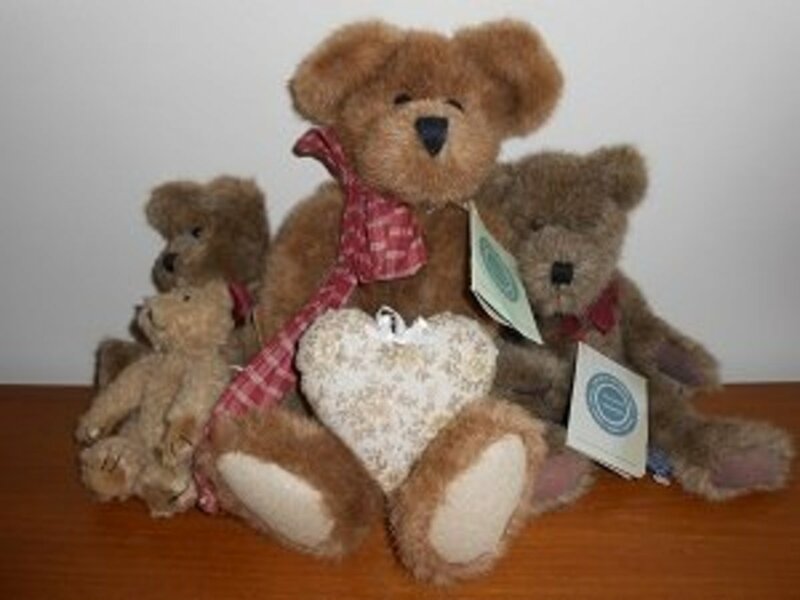 Donna is a professional doll repaint and customizing artist with over 17 years of experience. 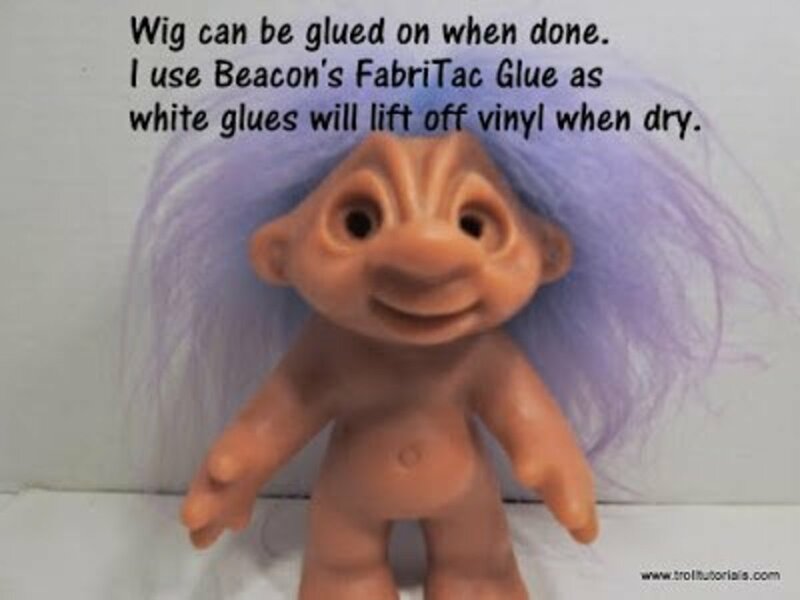 Removing troll hair isn't difficult, but it can require a bit of elbow grease and a couple of tools to aid you. 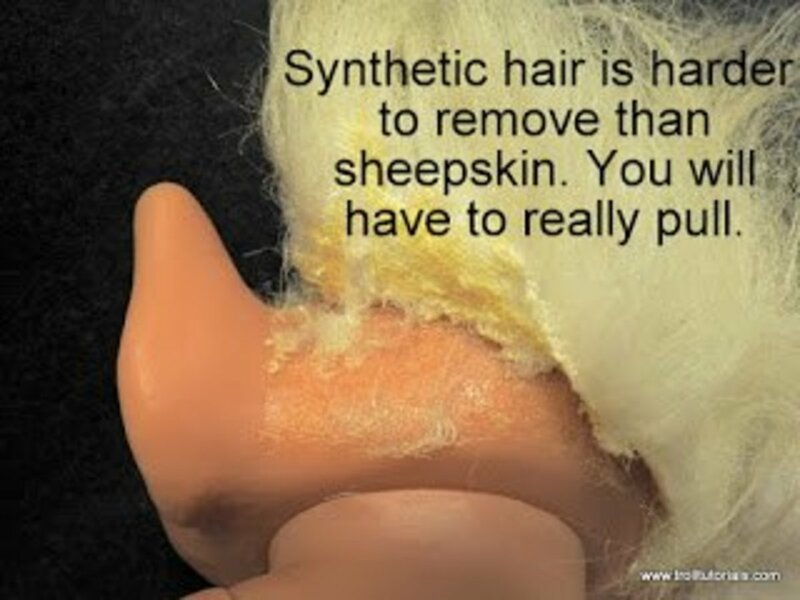 Synthetic hair is more stubborn than natural sheepskin hair, in which the hair is still attached to the leather hide. Natural sheepskin hides peel off pretty easily. It's the fake hair that will give you trouble. 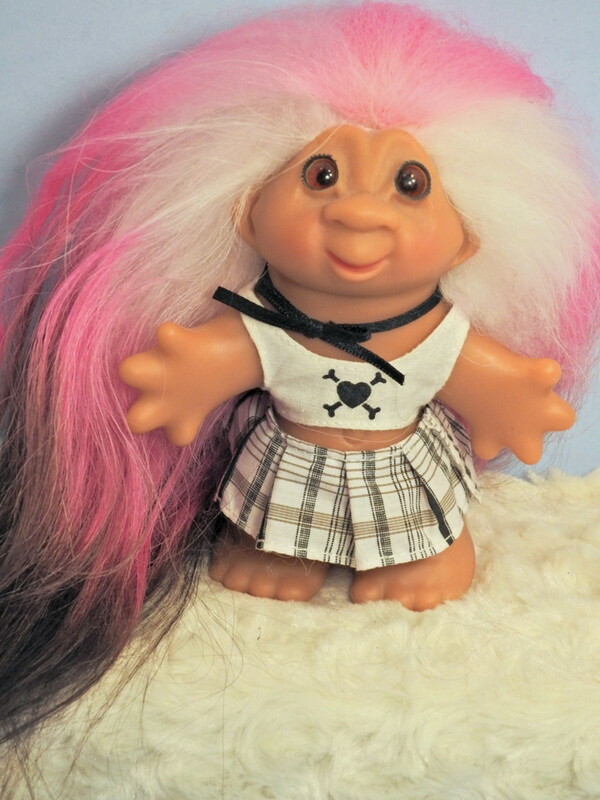 Synthetic hair can be found on many varieties and makes of troll dolls. 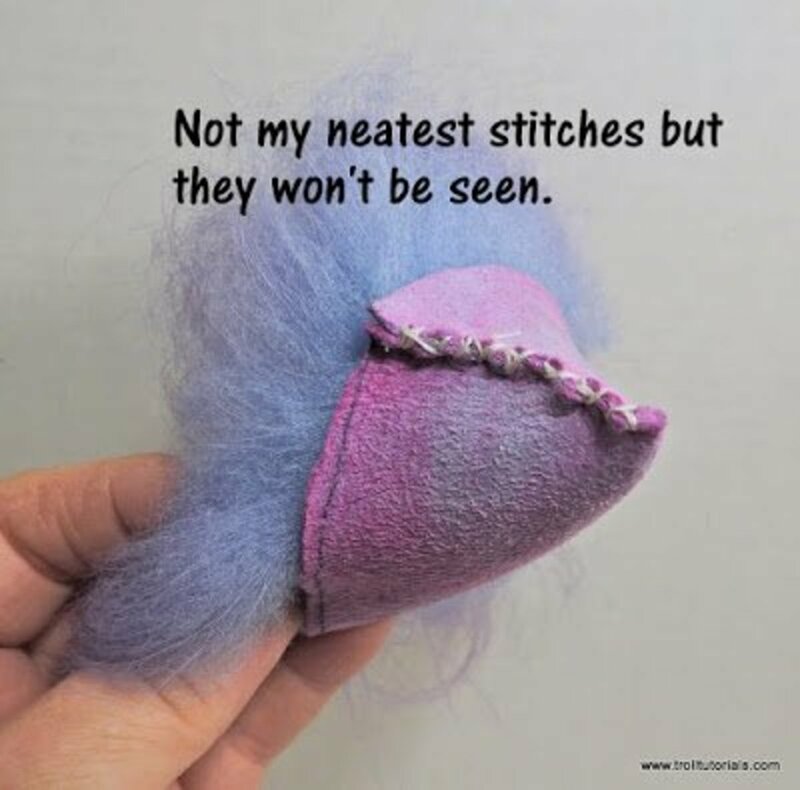 It is generally coarse and vibrantly colored, and the glue makes it very hard to remove the cloth backing from the troll's head. 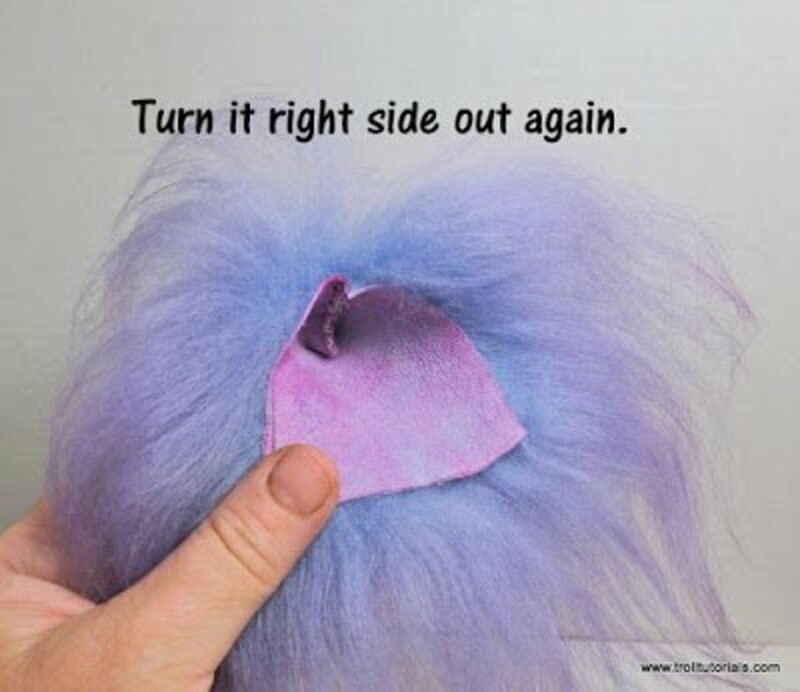 This troll hair removal tutorial is shown on a 9" Dam troll. The method for removing the hair is similar on most sizes with cone heads. 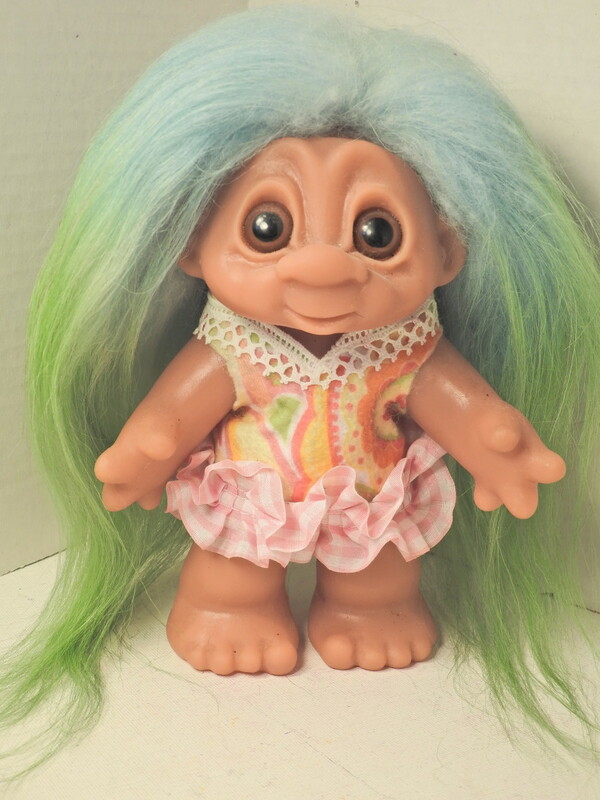 This Dam troll (circa 197) has synthetic hair. 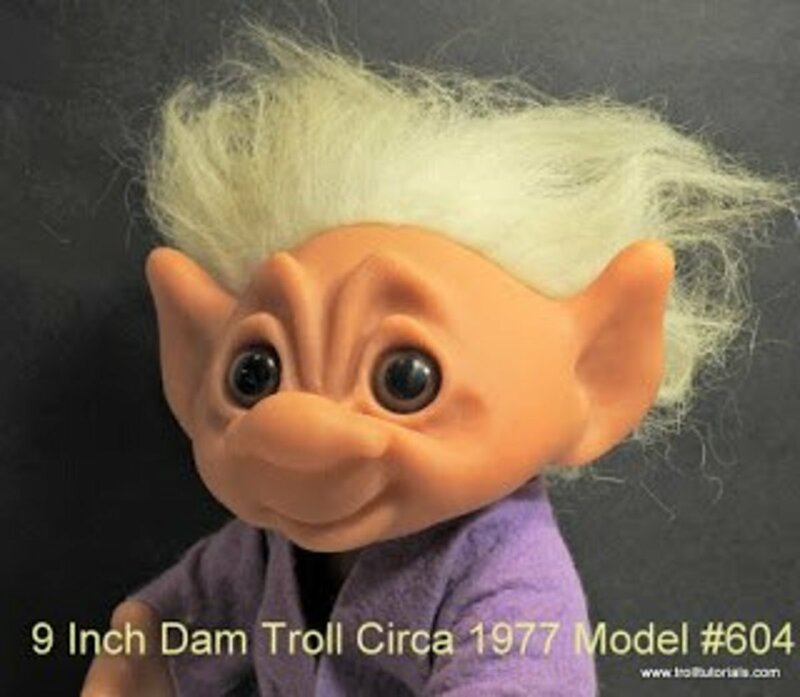 I got the above Dam 604 troll recently, and he had some pretty ratty hair. In order to start removing the old troll hair, I peeked under the back hairline to see if there was a good spot for me to start peeling up the hair. Using pliers, I started by grabbing the hair wherever I could and pulling up as if to peel it off. Getting it to peel off is not always easy. 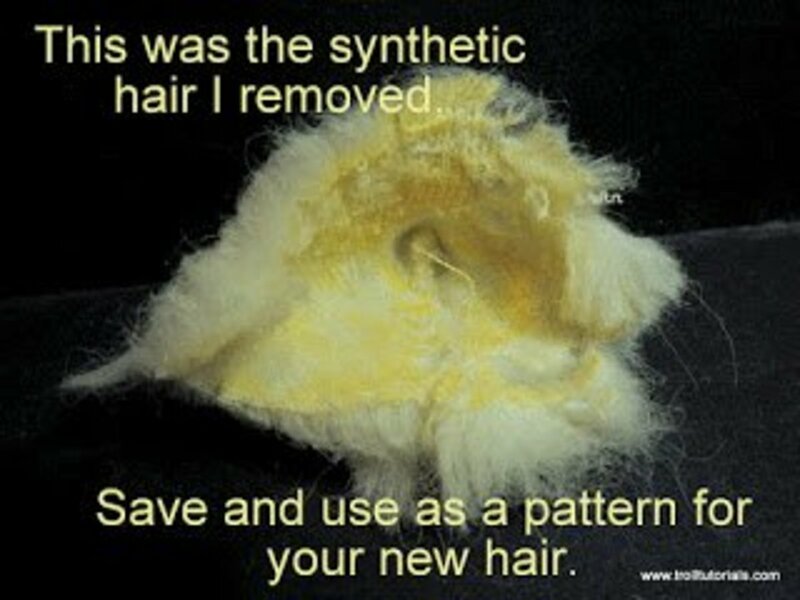 Synthetic hair can sometimes be difficult to remove. The glue binds to the fabric securely. 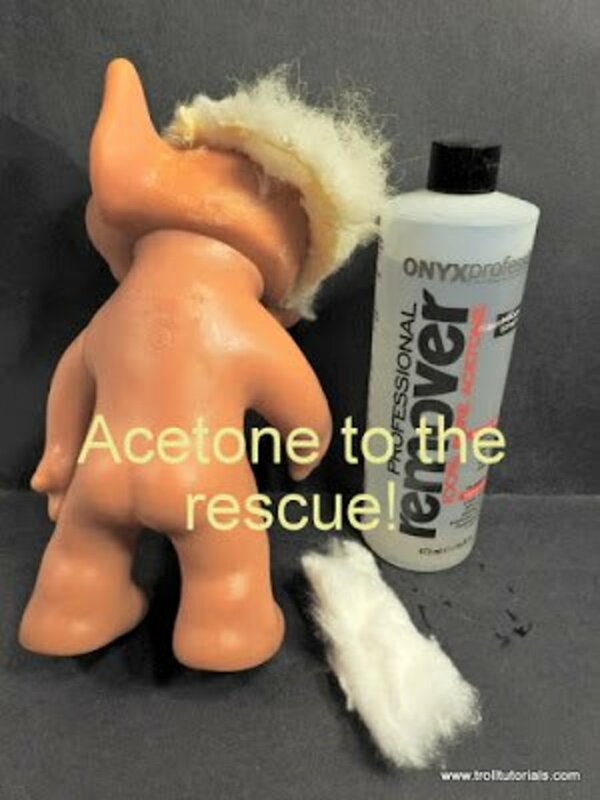 As you can see above, the glue really likes to hold on to synthetic troll hair. It takes a lot of pulling and tugging to get it to come loose. Sometimes, despite your best efforts, a little help is needed with the troll hair removal process. I like to use acetone; Onyx brand is one you can get in the beauty supply store, but any acetone will do. It will not hurt the vinyl on your troll at all. I have used it on the entire body of some trolls, and they remain in perfectly fine shape, but it is always wise to test on a small area first to make sure it won't cause any damage. 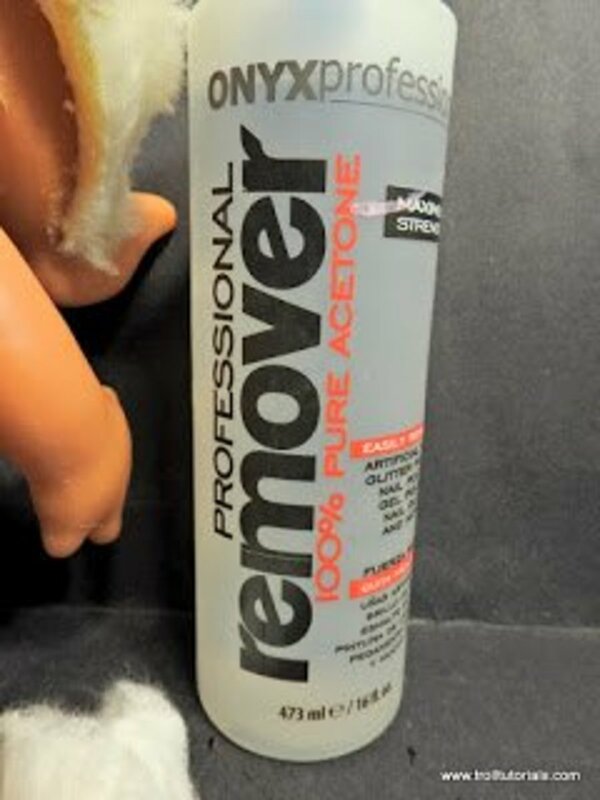 Cotton balls and acetone can be used to soak the base of the hair where it is glued to the doll's head. Hold it tightly. Apply and keep pulling, repeating as necessary. 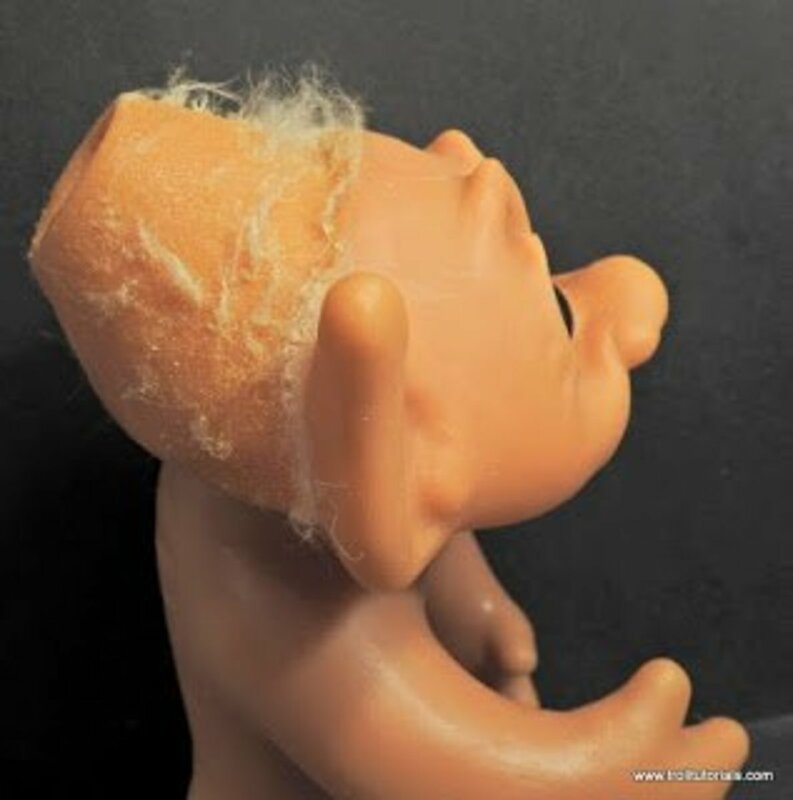 Finally, with the help of the acetone, I was able to pull all the old hair off my troll. Below was the piece that came off, mostly intact. 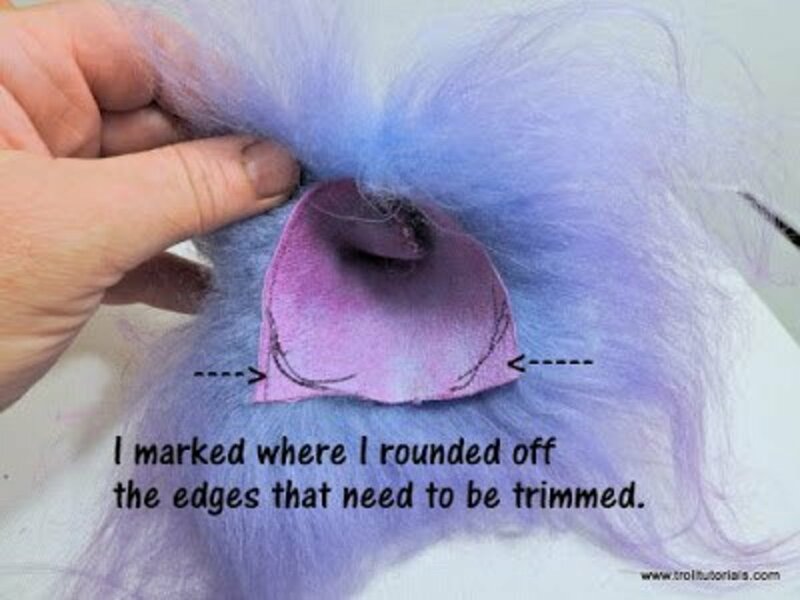 You can use it to make a pattern for a new troll hair wig if you trim off the stitching and lay it flat to measure its size and shape. Here is the head with the hair removed. A lot of fuzz remains, but I'll remove it with acetone. I just want to neaten it up a bit, but since the head will be covered by a new wig, it doesn't need to be perfect. These trolls sure do have cone heads, don't they? A little cleanup and he's ready to be re-wigged. If you plan on changing out the eyes, do it before you re-wig. And that's it—troll hair removal isn't too tough, but does sometimes require some pliers and acetone. Now that the old troll doll hair has been removed, we will replace it with a nice new piece of Icelandic sheepskin. It is common to refer to troll hair as "mohair," but in reality, it is Icelandic sheepskin, which is an entirely different animal. Mohair comes from a mohair goat, and the Icelandic sheepskin comes from a sheep. Icelandic sheepskin is super thick hair and comes in many lengths. 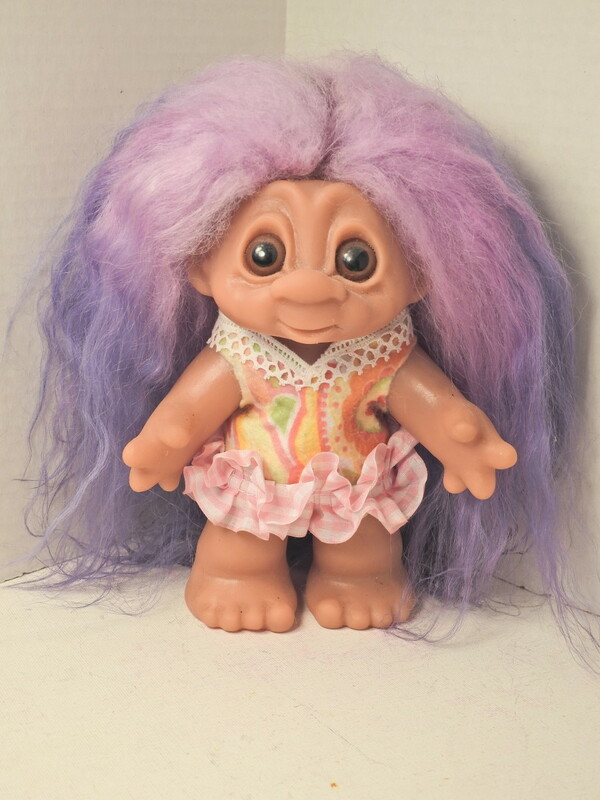 You can find it on eBay and Etsy if you search for "troll doll hair" or "troll wigs." 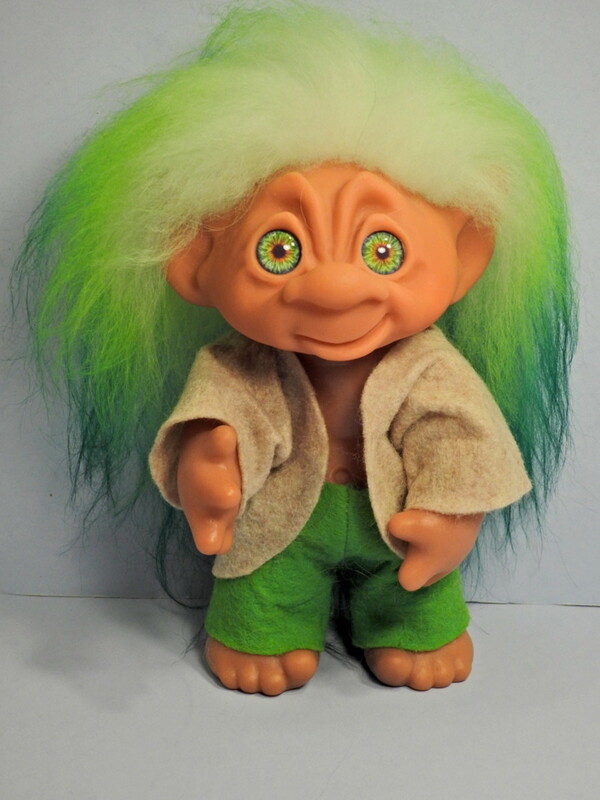 Sellers usually refer to the troll replacement hair as "troll wigs." Some of my customers have purchased Tibetan lambskin to replace their troll's hair, but it has a completely different appearance than Icelandic sheepskin. It's generally very curly or wavy, and hair length tops out at about 5", whereas Icelandic sheepskin hair can grow to 10" or more. 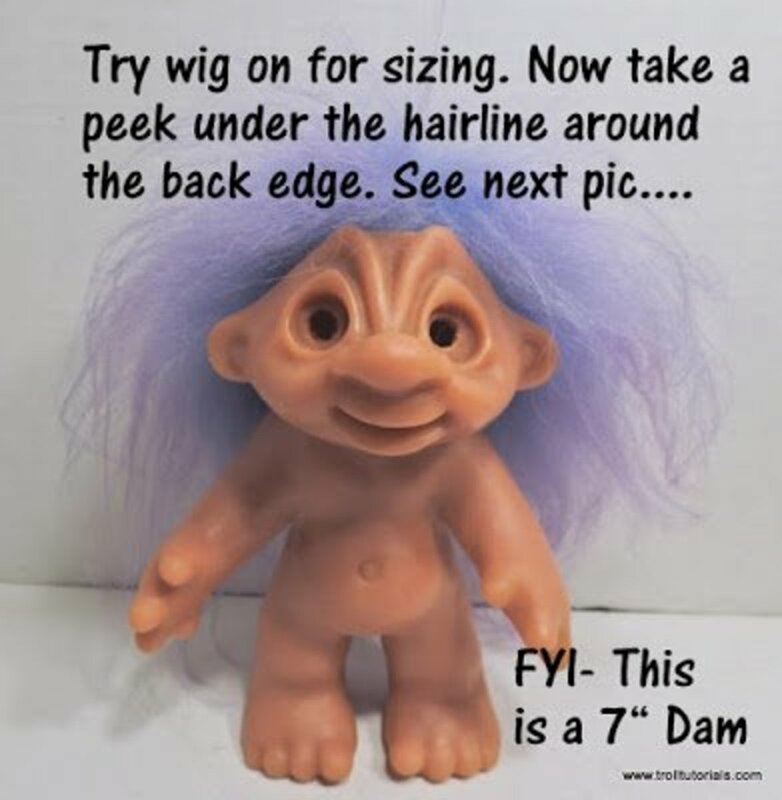 I have made this tutorial specific to a Dam troll with a cone-shaped head, as this can be difficult to figure out. 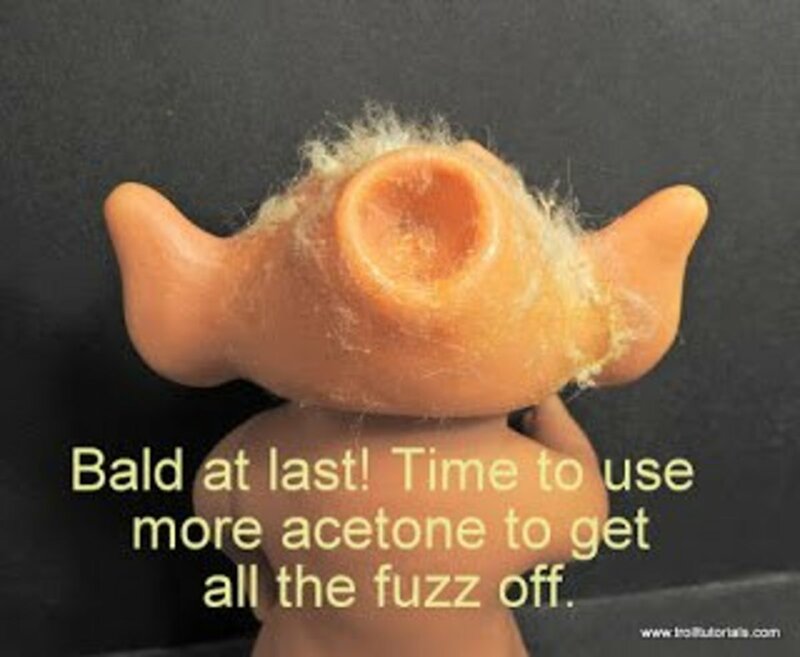 I know—it took me more than a year to find out how to replace the hair on my trolls! and a strong glue such as Fabri-Tac by Beacon. 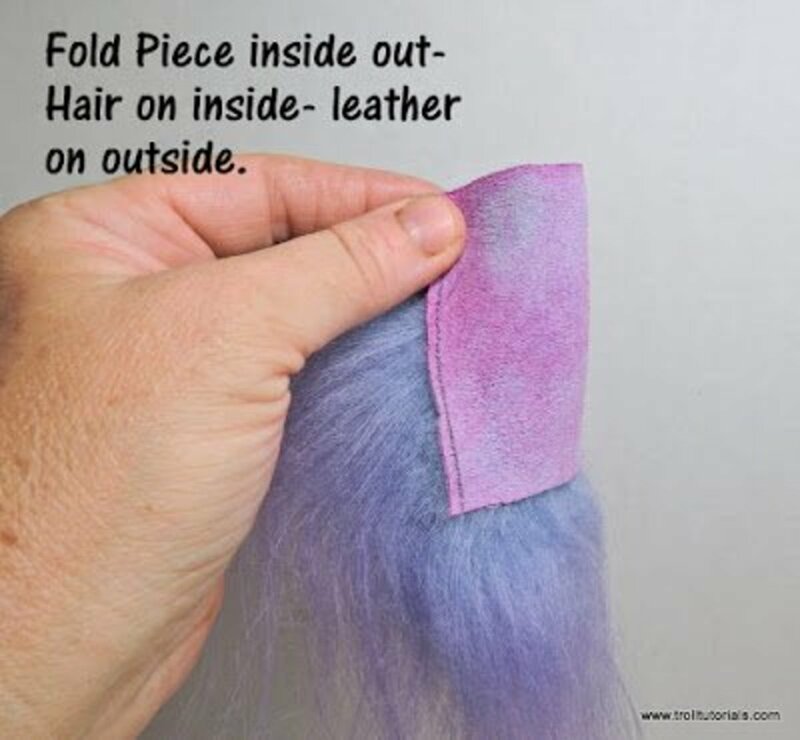 This method assumes you are working with a square or almost square piece of Icelandic troll hair on the hide, which is how most of it is sold on eBay or Etsy. The process outlined in this article is not the only way to replace a troll doll's hair. This is the method I use, and I am sure other people with more experience have their own technique. Whatever works for you—go for it. 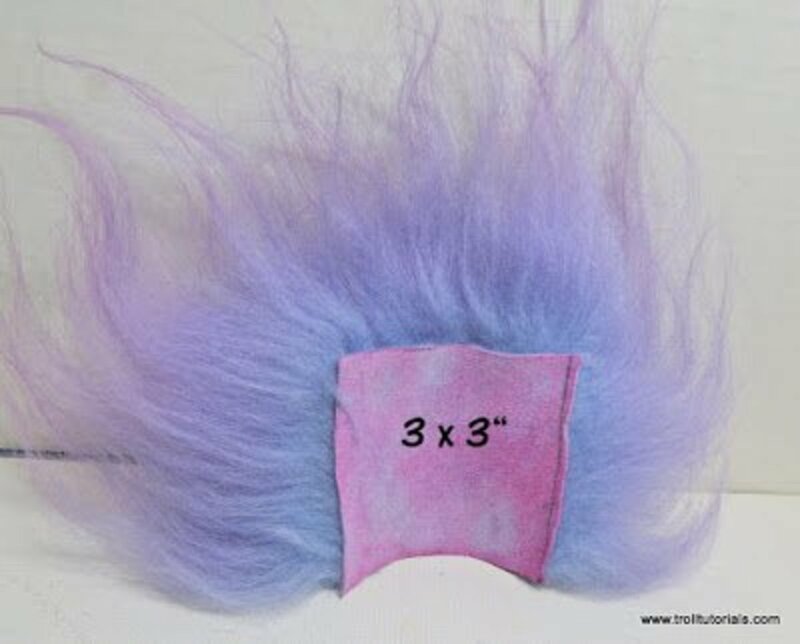 Icelandic sheepskin troll wig 3 x 3"
1. 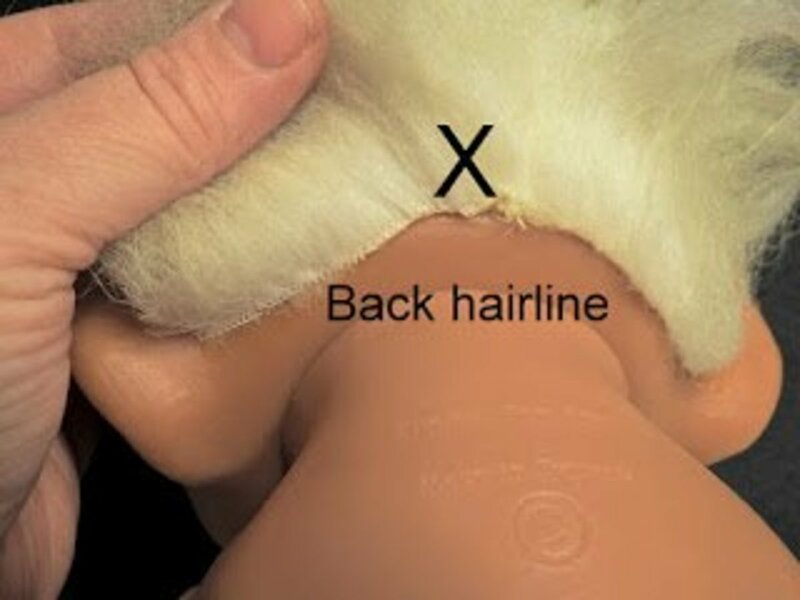 Fold the hair as shown above with the hair on the inside and the leather on the outside. 2. 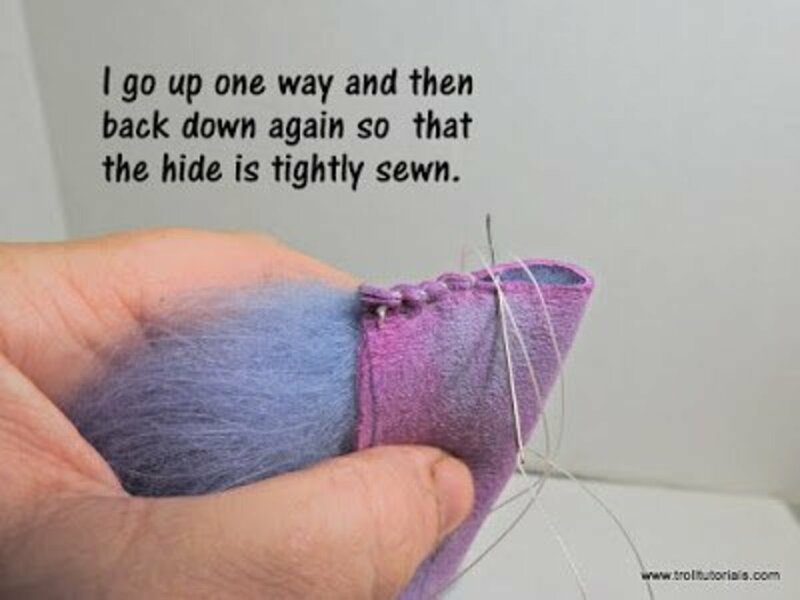 Make sure you tuck all the hair inside—poke it down so you don't sew it up into the seam. 3. 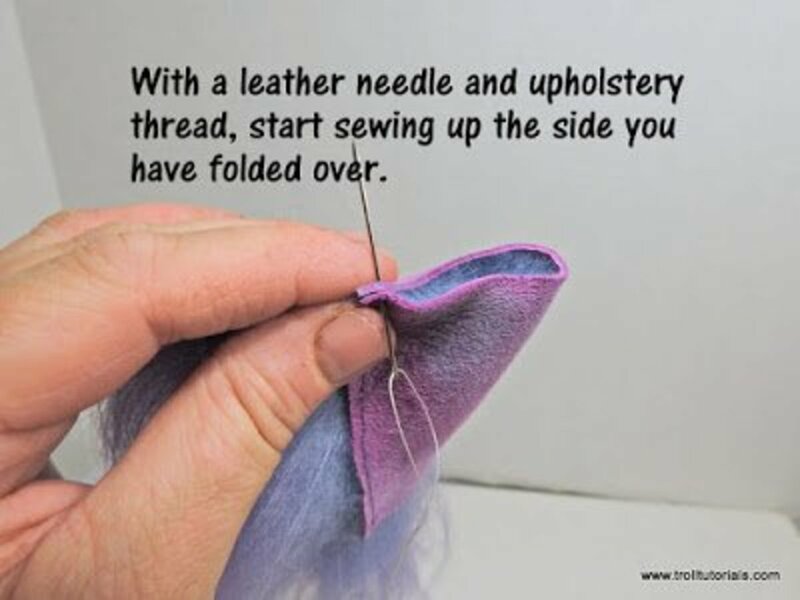 Using a leather needle and upholstery thread, sew up one side and back down again for added strength. 4. 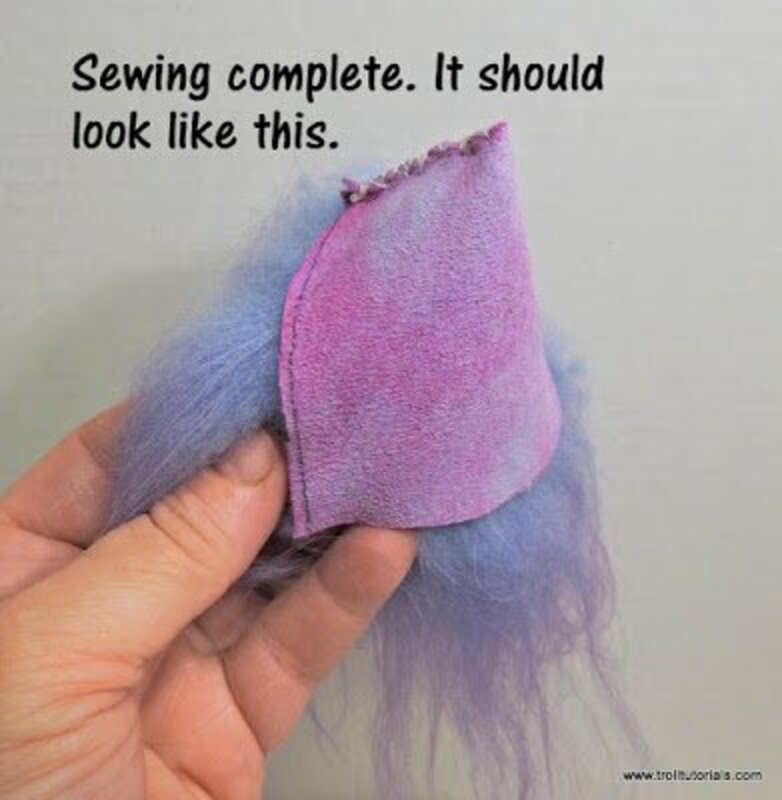 When you are done sewing up your troll replacement wig, it should look like the above photo. 5. 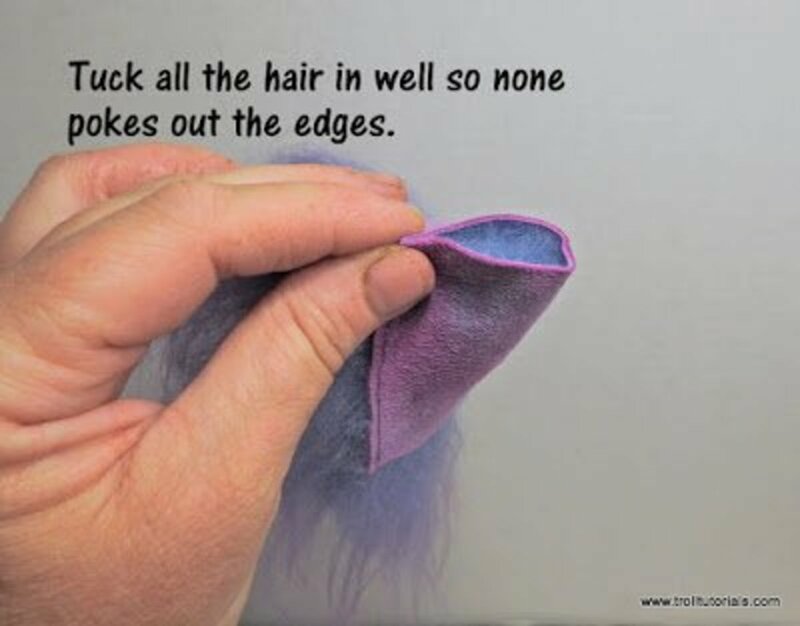 Take your troll wig and turn it back the right way so the hair is on the outside. 6. When you turn the wig right side out, you may notice that a little bit of it didn't poke back out but still sticks inside a little as shown above—that's okay. If you leave it this way, you can fit that spot into the hole on the cone head—if there is one. 7. 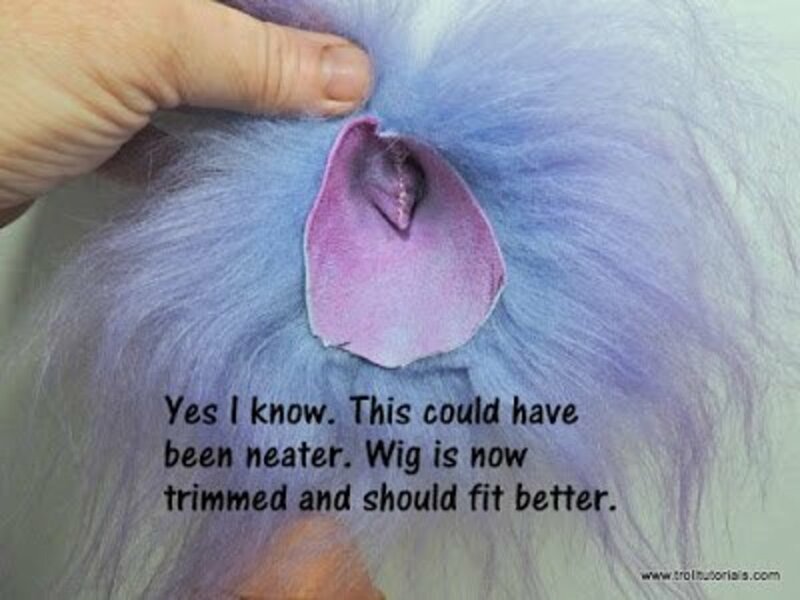 Now try the wig on your troll for sizing. You may notice that around the back edges it sticks out past the neck or goes too low down on the back. 8. You will probably have some overhang somewhere. See above. 9. We need to trim the wig so that the back hairline is more rounded and fits better. 10. Above I marked where I need to trim. Slip a small pair of scissors carefully under the hide as close to the leather as possible and take tiny snips to remove the excess. You don't want to just go cutting through the hair and ruin it! You should have very minimal hair loss. Warning: Cutting through leather with scissors can really dull them! So don't use your best sewing scissors for this. 11. The wig is trimmed and now can be glued on. 12. 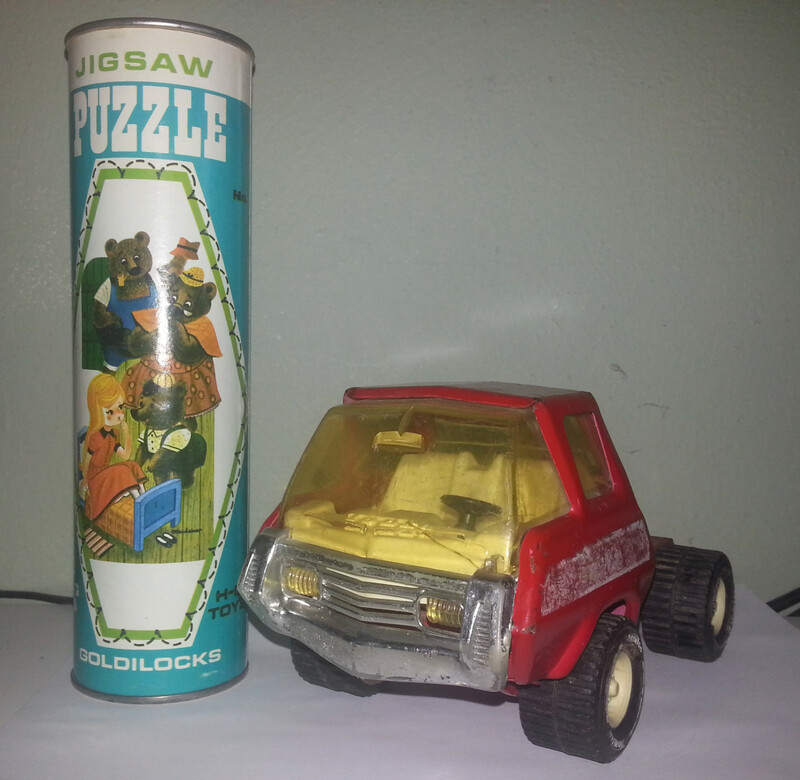 I like Beacon's FabricTac glue. It holds leather well enough and does not pull off vinyl like white glues will do—or, heaven forbid, hot glue. Yikes. All done. 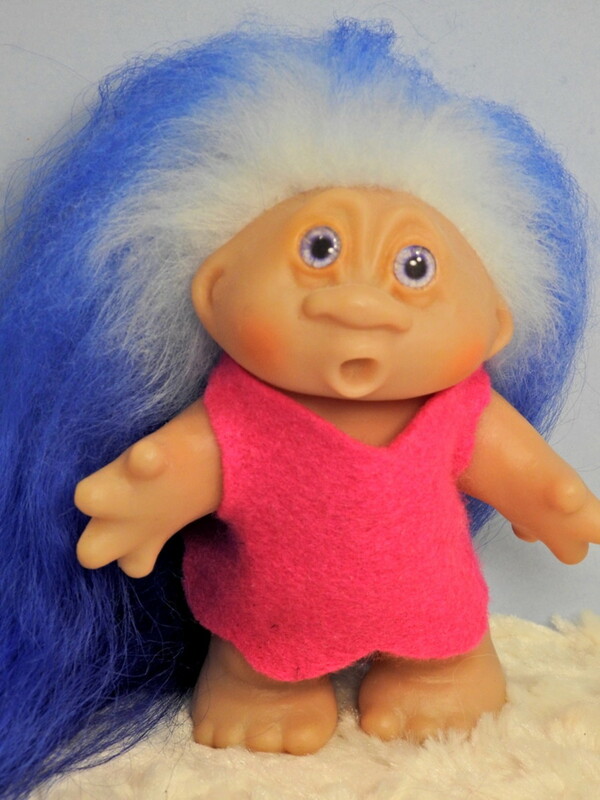 Your troll's hair has been replaced with a nice Icelandic wig, and they are ready to do what trolls do. Hope you enjoyed this troll tutorial!